There was a time in my life when I looked at mattresses in fairly simple terms: too soft or too firm hurts my back. Since the majority of the mattress industry steers consumers to medium-firm, I suppose I wasn’t alone in my thinking. My employment here at iSense Sleep is timely, since I’m at the beginning stages of shopping for a new mattress. Had I not spent the first half of 2018 learning from our resident experts, I probably would have listened to one of the myriad of advertisements out there and gone with a medium-firm mattress that relieves pressure points. And it probably would have felt really comfortable for the first night—anything’s better than the ancient bed I’ve been sleeping on. But that comfort wouldn’t last. Why? A few reasons. 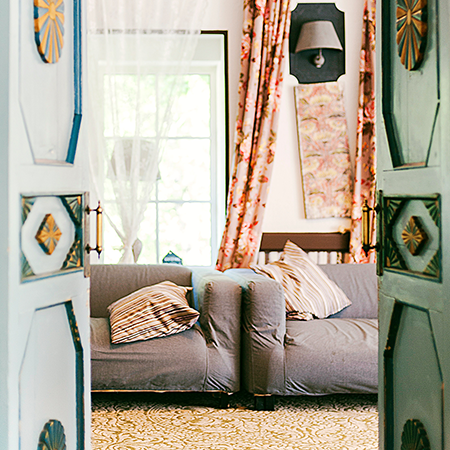 Comfort’s a tricky thing. What feels good to me won’t feel good to you or even the person sleeping next to me in bed. We’re all different, with different body types, builds, and perceptions. My comfort isn’t your comfort. Heck, what I consider comfortable tonight might not even be the same as what I consider comfortable next week. Comfort doesn’t mean support. Or rather, relief of pressure points does not equal spinal alignment, no matter how much marketers try to convince us that relieving pressure points will make us comfortable. A soft bed will relieve those pain points where my body pushes into the mattress, but it tends to also leave my spine curved, or out of alignment. That’s why a bed can feel amazing in a showroom and leave you in pain once you’ve slept on it. Comfort changes. 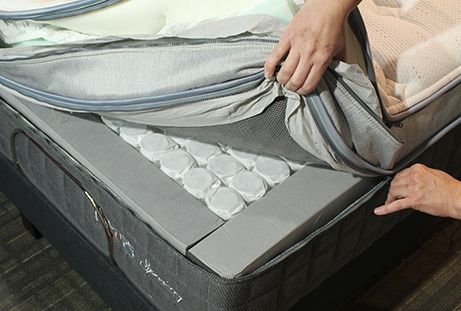 Not only do my comfort needs change over time, but a mattress’s ability to meet those needs changes over time. Just like a favorite chair will eventually wear unevenly, leaving the imprint of our bum from use, mattresses degrade over time. So a bed that started out medium firm will eventually be medium or even just plush with age. Our CEO and Founder, Paul Longman, believed that putting adjustable comfort in a premium mattress would solve those problems. Well, most of them. To tackle that last one, he made the beds modular, meaning they come in a zippered case so components can easily be changed if needed. 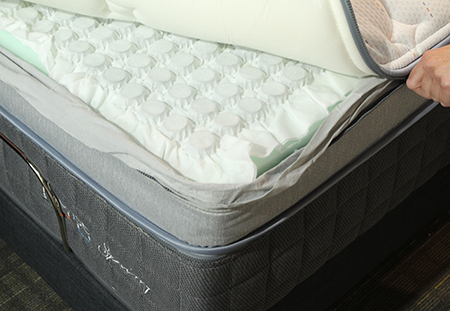 That, coupled with adjustability, greatly extends the life of the mattress. Paul’s such a believer in adjustability being the key to a true blend of comfort and support, he designed an adjustable pillow and partnered with ErgoMotion to provide adjustable bases for our mattresses. By giving people control over the elements of their sleep system, he helps them sleep better. That’s the heartbeat of what we do. Here in the office, we have an Operations Director who can tell you if your spine is aligned at a glance. Since loaning him out to our customers probably isn’t a viable option, I asked him how people can tell in their own home if their spine is aligned. Method 1: When you lie on your back, is there a gap between your back and the mattress? Can you slip your hand in between the two? If so, your spine isn’t getting the support it needs. You should feel the mattress pressing gently into the small of your back. Conversely, if you can feel your body bending into a slight “U” shape, your spine is out of alignment and you’ll wake up with a sore back. 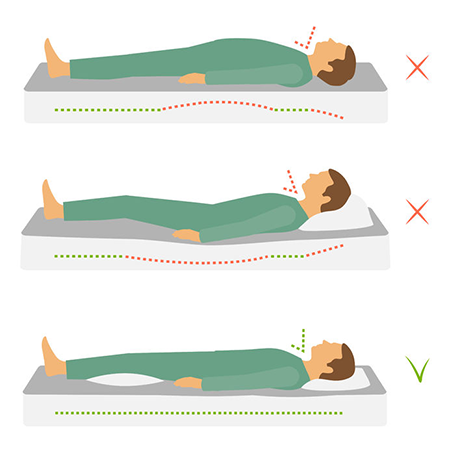 Method 2: Lie on your side and have a friend or partner check to be sure your body is generally a straight line. What they should see is a basically straight line from the base of your head to the hip area. If your head is too high, or too low, your pillow may be improperly supporting your upper torso, neck and head alignment. If your hips are “sinking in” too much, causing a bend in your spine from mid-to-low back, you’re not getting the proper spinal alignment in your center 1/3, which will lead to stiff and sore lower back, along with hip distress. It’s important to note that the pillow is 20% of your bed. If it’s the wrong loft (height), your spine won’t be properly aligned. Of course we recommend our height-adjustable pillow, but whatever pillow you get, be sure it doesn’t put your head at an odd angle because that will keep you from getting the right alignment, even if you have the right bed. Now that I know about spinal alignment, I can tell the difference. When I lie on one of our beds and change the comfort level, I can feel the support coming up to fill in the small of my back. In truth, I’ve become a bit spoiled. Before iSense Sleep, it never would have occurred to me to have a fully adjustable sleep system. Now that I’ve experienced it, I’m not surprised that I’ve been plagued with sleep problems for most of my adult life. Adjustability really does solve the comfort problem.